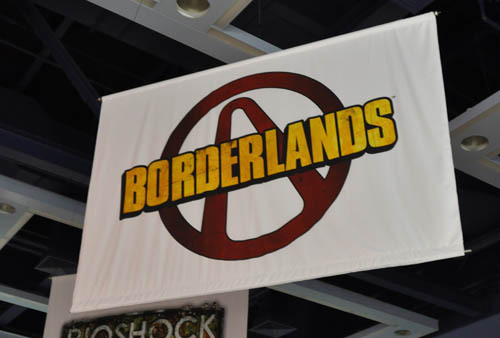 I'll admit, the game I was most looking forward to checking out at this year's Penny-Arcade Expo was Borderlands. The promise of an open ended action shooter with tons of RPG elements and items to collect is exactly the kind of game I can waste hours upon hours enjoying. I talked with Mikey Neumann of Gearbox about the game's co-op, and we've got some video of the game in action. If you listen closely you can hear Randy Pitchford tell the story about the art direction being switched - and how it almost caused the project to get shut down! As I sat down with the game in a local four player co-op session, it was immediately apparent the game is built for teamwork. Enemies will scale not only in level and difficulty, but in numbers as the number of players increase in the game. Several of the larger creatures took the work of all four team members to bring down the giant purple beast, who was able to separate the group as it charged us knocking players away. It was a tense moment, especially when the raiders attacked us. Soon we were down, and a short mini game pops up where you can fight for your life - or if you are lucky enough - have a teammate come by and revive you. If not you'll respawn and have to work your way back. The action in Borderlands was fast and frantic, only broken up by the on screen dialogue boxes of information for the weapons. The game features an over arching story broken down by several storylines for the characters, that any character can play. With over 50 in game areas, including towns where the missions are dealt out, there's plenty to keep you busy with Borderlands. So did Borderlands live up to my expectations? From the tease I saw of it I'd say definitely yes. There's a ton of potential here for an addicting game, one in which you can co-op with up to three friends. Split screen, online play, and LAN play are all at your disposal. Page created in 0.2520 seconds.